United Nations peace operations are the leading international partner of national institutions implementing disarmament, demobilization and reintegration initiatives, designing context-specific programmes for members of armed groups. Through a process of removing weapons from the hands of members of armed groups, taking these combatants out of their groups and helping them to reintegrate as civilians into society, disarmament, demobilization and reintegration seeks to support ex-combatants and those associated with armed groups, so that they can become active participants in the peace process. What is Disarmament, Demobilization and Reintegration (DDR)? Disarmament, demobilization and reintegration lays the groundwork for safeguarding and sustaining the communities to which these individuals return, while building capacity for long-term peace, security and development. In situations where it is too early or not possible to carry out disarmament, demobilization and reintegration work the UN supports Community Violence Reduction programmes that lead to the right conditions for political processes to progress and armed groups to disband. 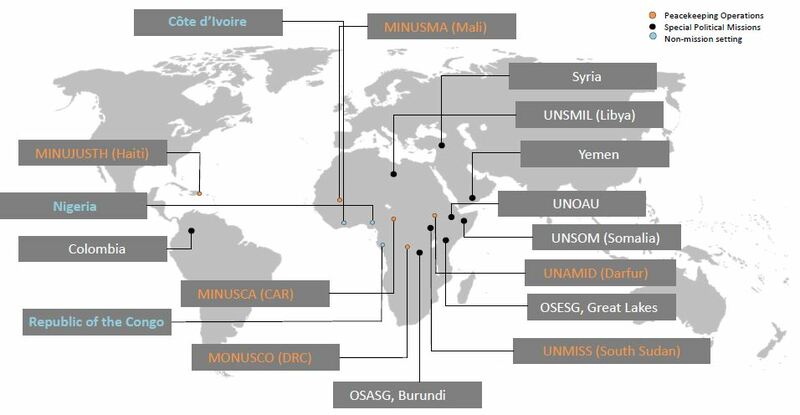 As of 2017-2018, the team of OROLSI’s Disarmament, Demobilization and Reintegration Section was supporting disarmament, demobilization and reintegration processes in UN Peacekeeping Operations in the Central African Republic (MINUSCA), Darfur (UNAMID), the Democratic Republic of Congo (MONUSCO), Haiti (MINUJUSTH), Mali (MINUSMA), and South Sudan (UNMISS). The Disarmament, Demobilization and Reintegration Section also supports operations in UN Special Political Missions in Colombia (UNVMC), Libya (UNSMIL), Somalia (UNSOM), Syria (OSE-Syria), and Yemen (OSESGY), the UN Office to the African Union (UNOAU), the Office of the Special Adviser to the Secretary-General in Burundi (OSASG-B) and the Office of the Special Envoy of the Secretary-General for the Great Lakes (OSESG-GL), as well as in non-mission settings such as Côte d’Ivoire, Nigeria and the Republic of the Congo. The UN is engaging more and more often with armed groups in complex mission environments. Disarmament, demobilization and reintegration and community violence reduction officers have become the first UN staff deployed on the ground with the mandate and expertise to engage directly with combatants. They are therefore called upon to provide advice on how to engage with armed groups and ultimately contribute to the signing of an agreement. The Disarmament, Demobilization and Reintegration Section has deployed mediation support to Darfur, Central African Republic, Colombia, Mali and Yemen. In the last decade, we have seen a shift to UN interventions taking placeearlier in the peace process, with operations deployed during intense conflict. Armed groups, which are unlikely to have signed a peace agreement, are often involved in shadow economies and transnational criminal networks. In some cases, armed groups may even be indistinguishable from communities. In response, the UN has adapted from traditional, sequenced and individual-focused disarmament, demobilization and reintegration to a more community-focused approach, known as “Second Generation DDR”. At the forefront of this is what we call Community Violence Reduction. Now mandated in Haiti, the Central African Republic, Mali, the Democratic Republic of the Congo and Darfur, the UN has implemented community violence reduction programmes encompassing a range of initiatives from labour-intensive projects, business incubation and community dialogue forums, to direct engagement with members of armed groups, as well as youth-at-risk, to prevent further recruitment. Community violence reduction also plays a key role in reducing tensions at the grassroots level to increase opportunities for social cohesion and conflict resolution. As the Under-Secretary-General for Peacekeeping Operations noted during the 10th anniversary of community violence reduction (CVR) on 16 November 2016: “CVR has proven useful in many different contexts, precisely because it is agile and people-cantered…It is a watershed example of peacekeeping learning to adapt and innovate." The 2017 report of the Special Committee on Peacekeeping Operations recognizes the role that disarmament, demobilization and reintegration programmes play in managing the disengagement of combatants from violent extremist groups. The UN in Somalia (UNSOM) is supporting the Government of Somalia to implement the National Programme to assist disengaged Al-Shabaab combatants in reintegrating back into society. This offers a rare window of opportunity to further deplete Al-Shabaab’s ranks by offering security and alternative livelihoods. Religious mentoring and ideological rehabilitation represent a crucial component of this process. Four transitional sites receiving (ex-)combatants are currently operational across the country. Disarmament, Demobilization & Reintegration from UNSOM on Vimeo. UN DDR in an Era of Violent Extremism: Is It Fit for Purpose?